Most people know Forbes as a highly respected magazine with a laser-like focus on financial and investment news. Forbes also has a respected travel section. And no wonder – a big reason to make money is to enjoy life, and for many people, that involves travel. So when Forbes travels and talks, people listen. Now, like an increasing number of people, we discovered our love for caves while in Belize. Yes, Belize, famous for vast jungles concealing ancient Maya temples and cites, for the world’s second largest barrier reef and a mind-blowingly beautiful Caribbean coastline, also boasts one of the world’s largest, most intricate and majestic cave systems. So, imagine our delight when we saw the Forbes article, opened it, and the first cave they mention is in Belize! The Great Blue Hole that Jacques Cousteau made famous and has since attracted tens of thousands of divers from around the world and can be viewed from the international space station, is actually a cave. A cave standing on its side and under beautiful clear turquoise waters, but a cave nonetheless, with stalactites and all the rest. There are no bats, but, instead, gorgeous bat-like manta rays and a kaleidoscope of brilliant tropical fish. Another reason we were so attracted to the Forbes article is that it combines two of our favourite Belizean attractions – the Belize Great Barrier Reef/Caribbean seacoast and the vast network of caves Belize sits on top of. And, by happy circumstance, our favourite Belizean eco-resort, The Lodge at Chaa Creek, is the best place from which to experience both these wonders. Chaa Creek’s Rainforest to Reef all-inclusive Belize vacation packages have always been, for our money, the most affordable, seamless, and comfortable ways to combine an inland adventure (think Maya temples and caves) with a Caribbean Idyll. With various partner resorts on the reef, cayes and Belize’s Caribbean coast, having Chaa Creek organise the ultimate surf and turf holiday always made sense. And now that our favourite jungle lodge has formed Unique Hotels of Belize with the landmark Victoria House on Ambergris Caye and Naia Resort and Spa on the southern Placencia Peninsula, visitors to Belize can be confident of enjoying a similar level of Chaa Creek’s casual luxury at Belize’s three most popular destinations. The Great Blue Hole and other Caribbean attractions meet Belizean caves with seamless, carefree luxury. It doesn’t get much better than that. The Great Blue Hole is the only cave we actually dove, but we know some great ones you can swim or float into, or just generally get wet visiting. Or, if you prefer, you can stay dry. To our mind, this is the crown jewel of them all – after swimming into a naturally concealed entrance, wading along an underground stream, and climbing ladders to several artefact- laden levels, you’re rewarded with a scene straight out of Indiana Jones. Ancient altars with blood letting implements still in evidence, jade axe heads, lots of pottery, and, as you progress, the skeletons of sacrificial victims, culminating with the famously shimmering Crystal Maiden. If she doesn’t affect you, check with your doctor when you arrive home…something’s wrong. 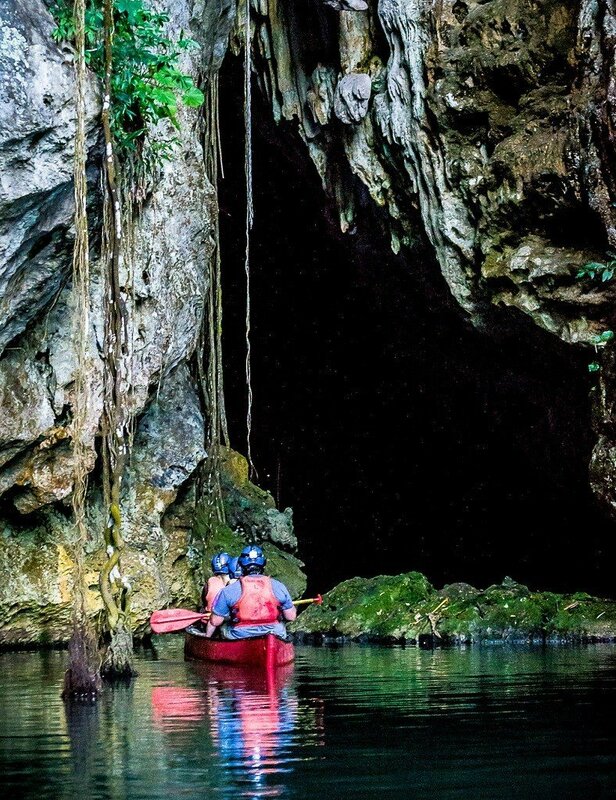 A leisurely canoe paddle takes you on a meandering mile long river excursion though this ancient Maya ceremonial cave. Even if you for some strange reason aren’t interested in Maya culture, this is a great cave for the natural beauty of cathedral-like chambers and passageways. Another flow-through caving adventure, Caves Branch is a favourite for inner tube floats though stunning beauty. You’ll notice the branding of “Ian Anderson’s Caves Branch”. No, he’s not the manic lead singer and flautist with that classic rock band Jethro Tull. This is a different Ian Anderson. AKA Actun Loch Tunich in Mayan, the Black Hole Drop is another massive sinkhole and one of the more exciting Belize caving adventures; living up to its name with an over-the-edge rappel (or abseil) 200 feet (approx. 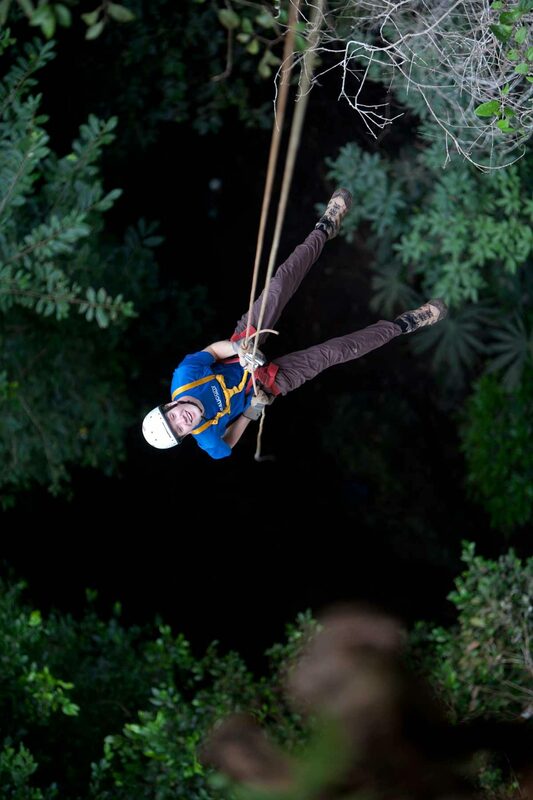 61 metres) down to a forest canopy and then another 100 feet to the ground below. Awesome! Is another favourite, having been discovered by one of Chaa Creek’s neighbours hunting for game back in the early days. Family run and informal, with plenty of Maya artefacts, it’s a great day trip. There are many other caves we like, but we’ve run out of space. 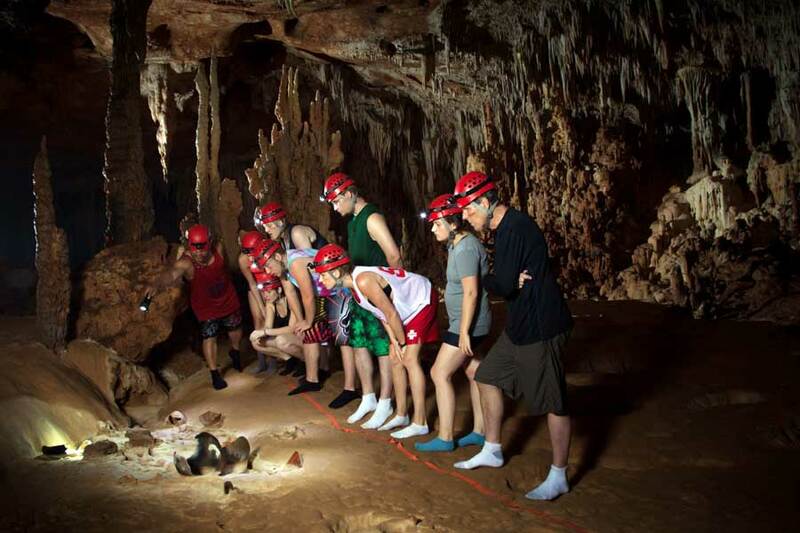 Head on over to https://belize-travel-blog.chaacreek.com/2015/04/7-astonishing-belize-caves-to-explore/ to learn more. Better still, have a chat with one of Chaa Creek’s friendly Adventure Vacation Specialists. Tell them what you’d like to do, and they’ll tell you how. And then, if you like, arrange everything – from picking you up at Belize’s International Airport until dropping you back off. It’s that simple. 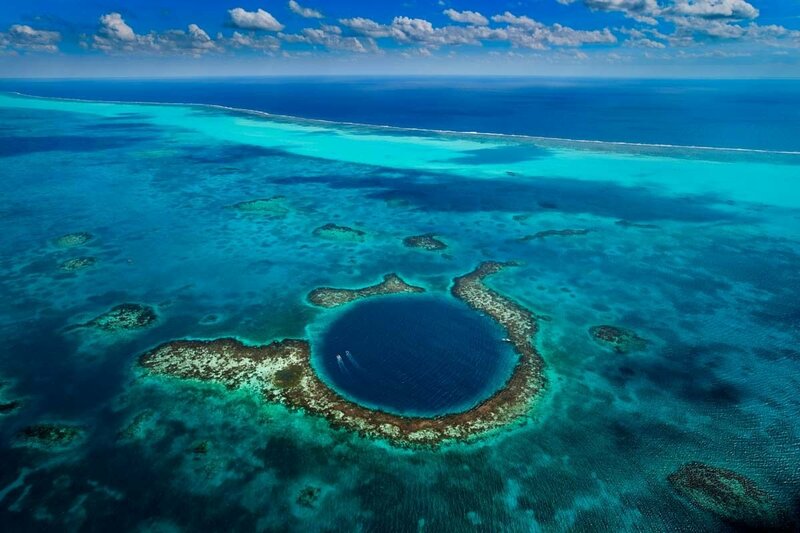 Diving a massive Caribbean sinkhole off the Belize Great Barrier Reef and abseiling deep into another inland? With great dining and luxurious amenities? Belize Educational Programs: Butterflies on the Road 2018!